The Axolotl is studied the world over for several reasons. All of the traits which make it so suitable for study, as for all living things, are dependent upon its genes. 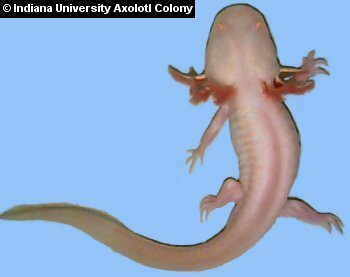 This page will attempt to give a brief overview of axolotl genetics, mainly from the viewpoint of the hobbyist, who tends to be most interested in colour. Axolotls have 28 chromosomes per cell, in fourteen pairs. Humans have 46 chromosomes in 23 pairs. A chromosome is a thread-like structure composed of DNA and protein. The length of a chromosome is made up of many units of DNA called genes. Each gene has a special place on a chromosome and the position which it occupies is called the locus of that gene. When an axolotl reproduces, the sperm from the male (which contains 14 chromosomes) and the egg from the female (which also contains 14 chromosomes) fuse to form the zygote, the first cell of the new axolotl. So each new cell of this new animal has 28 chromosomes. However, in the production of gametes (the sperm and egg cells) via the process known as meiosis, small exchanges of parts of the chromosomes take place (known as "crossing-over"), as well as a random allotment of chromosomes from the mother or father's own parents to each gamete (which means a gamete could have 2 maternal chromosomes and 12 paternal, or any other combination). So when axolotls reproduce, each new larva is a genetically distinct individual, different from its siblings and its parents. This is the essence of genetic variation. An animal's genotype is what its genes "say" it is, and its phenotype is the result of the gene, its expression. Mutant animals are those with genes differing from what is accepted as normal. The colour of axolotls is dependent upon pigment cells called chromatophores. These cells are melanophores (containing eumelanin, a black-brown pigment), xanthophores (containing carotenoids and pteridines, yellow and reddish pigments) and iridophores (containing crystalised purines, which impart a shiny iridescence). Each cell in an axolotl, as stated above, contains 14 pairs of chromosomes. Every characteristic of the animals is coded for by genes on pairs of chromosomes. The genes for the pigment cells are inherited independently of one another, and there is no known linkage to any other genes. So, each pigment type is coded for by two different genes, one on each of a pair of chromosomes. These contrasting genes that code for the same characteristic are known as alleles. A pair of alleles is written like this: X/x. A capital letter means that gene is a dominant gene, as opposed to the small letter, which means that gene is recessive. For example, the allele that controls albinism could be found in an axolotl in one of the following combinations: A/a, A/A, or a/a. If the animal was A/a, because a is recessive and A is dominant, the animal's phenotype wouldn't be albino, but it would still carry the gene for albinism (since it has an "a"). Since it carries both "A" and "a", it is known as "heterozygous". If the animal had the A/A combination, its phenotype wouldn't be albino, and it wouldn't carry the gene for albinism (both genes being the same, it is called "homozygous" for "A"). If it were homozygous for "a" (i.e. a/a), the animal's phenotype would be albino. Since "a" is recessive, both alleles need to be "a" in order for albinism to be expressed in the phenotype. Albinism results in a lack of eumelanin (the dark pigment). In axolotls, it also results in an increased number of xanthophores (yellow pigment cells). In the same way that a/a results in a lack of eumelanin, m/m (melanoid) results in a lack of iridophores. Such animals are very dark, with no reflective pigment cells at all. M/m or M/M would result in normal iridophore development. Animals homozygous for "ax" (i.e. ax/ax) are axanthic, meaning they have no visible xanthophores or iridophores. Such animals are almost as dark as melanoids. Animals homozygous for both the albino gene and the axanthic gene appear to be slightly off-white (yellowish). The following table summarises the colour genes. You may have noticed the "d" gene. This gene is a developmental mutant and not a pigment mutant like the others. Animals homozygous or heterozygous for "D" produce large numbers of yellow xanthophores. In combination with melanophores, we get the wild type colouration (dark brown/olive-green). However, in animals homozygous for "d", the normal pigment cells are produced, but they never migrate off the neural crest of the embryonic animal, resulting in the white phenotype. It is important to realise the this animal is not albino. This phenotype is white, but has dark eyes. It is known as leucistic. Simple albinism in axolotls leads to a yellow/golden animal, with red/pink eyes. In order to produce a white albino, the animal must have the d/d genotype in combination with the a/a genotype. Melanoid albinos (m/m with a/a) are also white animals with pink/red eyes. This can make initial identification of a white albino's phenotype difficult to determine for the novice. Here are photos and descriptions of some of the commonly available colour variants and an explanation of the genetics behind them. Wild types vary somewhat in exact colour, but are generally a shade of dark brown with black, yellowish, and shiny patches/speckles. The phenotype of wild type animals is dark, non-melanoid, non-albino and non-axanthic. In the photo below, the animal on the right is a wild type female. This is the typical wild type appearance. You may also encounter tan or very lightly speckled variants. Wild types are not homozygous for any of the colour mutations. In the above photo, the animal on the left is a female melanoid. As described earlier, melanoids lack the "shiny" pigments (crystalised purines). The amount of yellow present is also much reduced. In contrast, the number of melanophores (dark pigment cells) is greatly increased, resulting in a black animal. The easiest way to determine if an animal is melanoid or a dark wild type is to look at the eyes: non-melanoids have a shiny ring around the pupil of the eye, while melanoids (and melanoid albinos) do not. Melanoids are homozygous for "m" only (i.e. m/m), but they may be heterozygous for other colour mutations. Commonly known as leucistic, the phenotype is d/d, non-melanoid, non-albino and non-axanthic. Here's a picture of a large adult female. Notice the black eyes and small number of melanophores on the head and back which indicate that it is not an albino. White axolotls with black eyes are not albino. While d/d prevents the axolotl's pigment cells from migrating off the top of the animal, this does not necessarily mean that all leucistics will possess colour cells on the the head and back - look at the eyes to be certain. Phenotype is albino a/a (lacking melanophores). There are many kinds of phenotypically-different albino axolotl. Here are some of them. The first is the golden albino (D/D a/a or D/d a/a). It has normal migration of pigment cells, but lacks melanophores, hence the yellow/gold appearance. The third kind of albino is the white albino. It is homozygous for "d" and "a" (d/d and a/a). 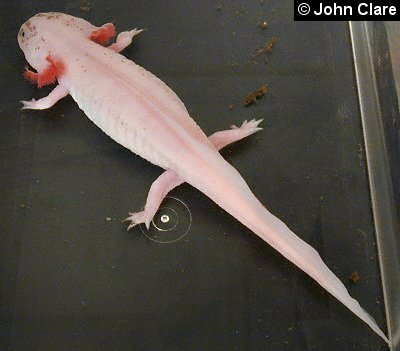 The photo below is one of the former Indiana University Axolotl Colony's white albinos. Note the presence of iridophores (shiny pigment cells) in its gill branches. The fourth kind of albino that I will discuss is the melanoid albino. It is homozygous for "m" and "a" (m/m a/a). This is a male axolotl. While a non-albino melanoid would be black, the combination of melanism and albinism "removes" all pigment except a tiny hint of yellow xanthophores on the head and back. Axolotls come in many different colour variations. 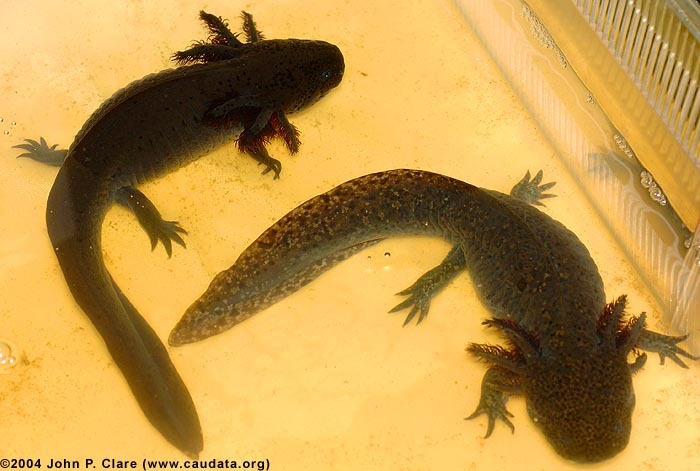 Axolotl breeders often produce an odd offspring whose phenotype defies what the breeder knows to be its genotype. Piebald axolotls (not just on the top of the body like a leucistic), yellow leucistics with black spots, and the harlequin (orange and black patches on a white axolotl) are just a few examples of what chance can present. 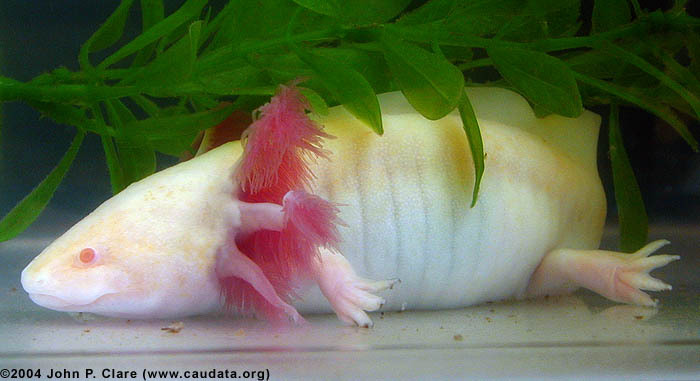 You can see the huge variety of axolotl colour variations in Caudata.org's User Photo Gallery. Keep your eyes open for unusually coloured axolotls that don't match the descriptions here. They might be very special indeed.